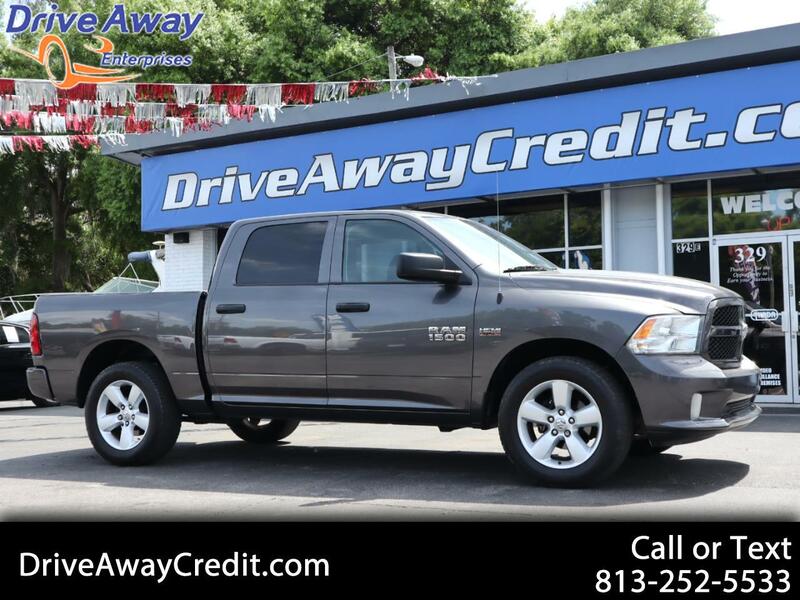 Take it to the next level with our tough 2014 RAM 1500 Express Crew Cab 4X2 shown in handsome Gray. Powered by our legendary 5.7 Liter HEMI V8 that offers 395hp while connected to a smooth shifting Automatic transmission. This Rear Wheel Drive offers near 22mpg on the open road and a smooth, comfortable ride with superior acceleration as well as the ability to tow 10,350 lbs! Make a statement without saying a word when you pull up in the athletic 1500 Express that is highlighted by a redesigned black grille, prominent wheels, drop in bedliner, dual exhaust and distinctive inserts that enhance the aerodynamics of this true workhorse. Enjoy traveling in comfort and style with air-conditioning, cruise control and a tremendous six-speaker sound system with auxiliary and USB inputs. Anyone who sees it will admire the upscale interior that will make you smile every single time you slide in. Designed so you can work smarter, not harder, you'll also find automatic headlights, a locking tailgate, and vinyl floor covering that can take some severe punishment. Visit Drive Away Enterprises online at Driveawaycredit.com to see more pictures of this vehicle. Call or Text us at 813-252-5533 today to schedule your test drive. Message: Thought you might be interested in this 2014 RAM 1500. All advertised prices exclude government fees and taxes, any finance charges, any dealer document preparation charge, and any emission testing charge. The price for listed vehicles as equipped does not include charges such as: License, Title, Registration Fees, State or Local Taxes, Dealer Prep, Reconditioning Costs or Delivery Fees. Warranty on most vehicles we sell, drive away with peace of mind. Coverage is subject to limits and exclusions. Extended service contracts are available for purchase. See store for details. Finance terms may vary.